This morning, we were alerted to a site at the URL demoslam.com. Imagine our surprise when it turned out to be some sort of Google project. Or at least, that’s how it appears. Hovering over the people in the stands makes them hold up signs that say “Men in wigs rock!” and “Support overweight rabbits!” Again, weird. Based off of all of this, it sounds like Google is hosting some sort of competition to see what people on the Internet can come up with using their various products and technologies. My guess would have been that this will be an HTML5 project, similar to their HTML5Rocks site or more recently their Arcade Fire experience, but the fact that this entire teaser is in Flash seems to go against that idea. We should know more soon. 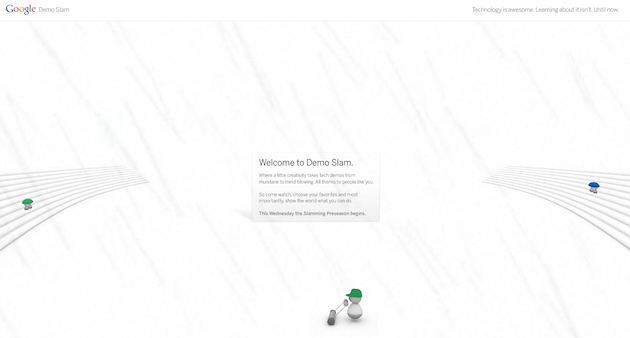 Update: It is a demo competition highlighting Google products. Here is the Google blog post.